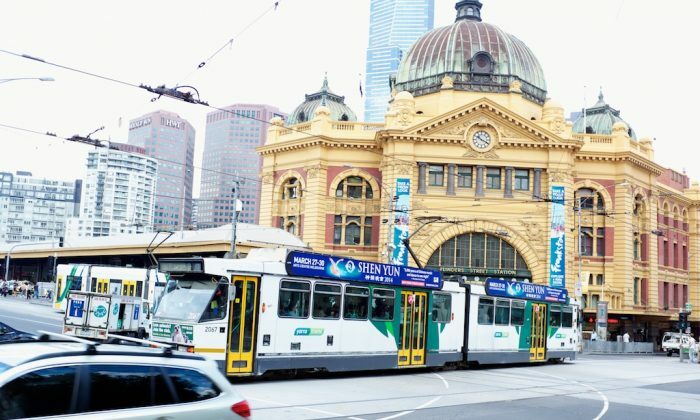 MELBOURNE, Australia—Shen Yun Performing Arts International Company arrived in Melbourne, Australia, Wednesday March 26. The New York based Shen Yun opens on Thursday March 27, the first of 32 performances in seven cities across Australia and New Zealand. The Arts Centre’s State Theatre sets the stage for the first of five performances. With seating for over 2000 and one of the world’s largest stages, the State Theatre is the perfect setting for the world’s premier classical Chinese dance company, Shen Yun, to perform. Victorian state officials, proud of Victoria’s multicultural diversity and appreciation of the arts, have sent welcome greetings to Shen Yun. Senator Jacinta Collins said, “I warmly welcome the return of Shen Yun Performing Arts to Melbourne. Mr. Luke A Donnellan MP, State Member for Narre Warren North, Shadow minister for Road Safety and the TAC, said, “It is with great pleasure I welcome the Shen Yun Performing Arts return to Australia to grace the stage of the Melbourne State Theatre from 27-30 March, 2014. What a wonderful way to promote the exchange of Chinese and Western culture and rich customs through story-based dance, right here in Melbourne. Mr. Jude Perera MP, State Member for Cranbourne, Parliamentary Secretary to the Shadow Minister for Multicultural Affairs said, “It is with great pleasure in welcoming the return of Shen Yun Performing Arts back to Australia. We can also be proud that we remain a welcoming and accepting society built on respect for one another. That is why I encourage Victorians of all backgrounds to participate in every aspect of our social lives. I wish to congratulate the Falun Dafa Association of Australia, Victorian Branch for presenting Shen Yun to Melbourne. I actively support and encourage people of all backgrounds to celebrate their rich cultures and also to share their rich cultures with others. And that is why I encourage everyone to continue building a welcoming and accepting society by crossing cultural bridges in their personal and social lives. The Shen Yun Performing Arts performances of a fantastic rich Chinese culture, compliments this. After five performances at the Arts Centre’s State Theatre, Shen Yun International Company will continue the Australasian leg or its 2014 World Tour at Canberra, before flying to New Zealand where they will perform in Wellington and Auckland and then returning to Australia where they will perform in Sydney, Adelaide, Gold Coast and Perth.